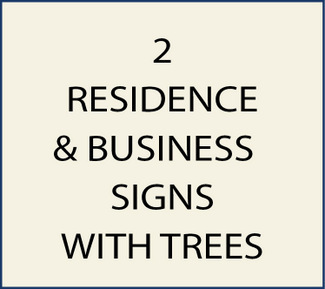 This Section 2 of Gallery 21 shows photos of custom property name/address signs for mountain, forest, and lake residences and businesses. The signs in this section have text and feature either evergreen and deciduous trees, or their branches, pinecones, acorns, etc.as artwork. These signs are carved in High-Density-Urethane in either 2.5-D with 3 or more levels of relief, or 3-D bas relief, or they can be engraved. These signs are hand-painted with an artist brush or airbrush. They are clear-coated twice for additional UV protection, and will last decades. These signs may be hung near the residence or business entrance, mounted on a wall, a gate, a post, or hanging from a wrought iron scroll bracket mounted to a post or a roof eave..